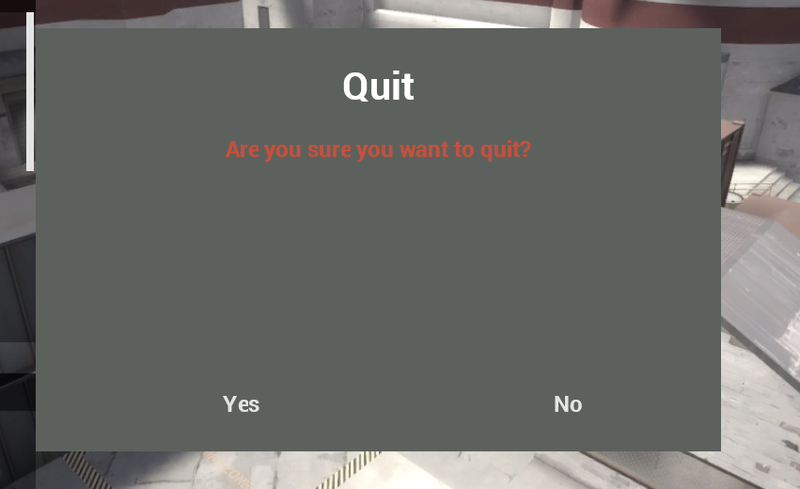 How to delete custom hud's custom main menu and use the default one? I'm using Morehud. JBDo these dialogs have a specific file or are they defined somewhere in clientsheme.res? You need to put these 2 files into resource/ui/econ. They're not in the standard tf folders, they're actually in the hl2 folders. I think the one you're specifically after is confirmdialog.res, but having messageboxdialog.res is just as useful because they're basically the same. [quote=JB]Do these dialogs have a specific file or are they defined somewhere in clientsheme.res? ReskerHow to delete custom hud's custom main menu and use the default one? I'm using Morehud. Vulcanthanks for the answer, how would I do the cowmangler meter number thing? Thanks for the help. But now the main menu has other problems. There is now quit button and the score tab is broken. Can these be turned back to normal? Basically, make your status spec panels have a red half and a blue half. Then set it up so that on red, the blue half is offscreen, and vice versa with blue getting red offscreen. It gets more complicated from there if you want to do other things (space it from the edge with refracts, resize the health bonus cross for sideways healthbars in both directions, etc.) but that's the jist of it. Press whatever key it's bound to and it will be brought to the foreground again (while in-game, not in the menu). Which UI file controls the map end scoreboard for casual mode? How would I go about removing avatars from foster's scoreboard for m0rehud, if possible? Also, is it possible to modify that tan coloured backing for the notification panel? You need to change the avatar_width at the top of scoreboard.res to "2"
find the font your damage numbers are using in clientscheme and add to it "outline" "1"
Where can I find the white highlight in the casual ui which indicates who you are? Is there any event triggered in hudanimations when a medic gets his ubercharge on the tournament ui? aurah YeeHawhow do i get a black outline on my damage numbers? (using flamehud) find the font your damage numbers are using in clientscheme and add to it "outline" "1"
how do i find which font my damagenumbers are using? KraytAlso, is it possible to modify that tan coloured backing for the notification panel? The tan coloured background should be the border of the element "NotificationToastControl" in econ/Notificationtoastcontrol.res. It loads fine when the whole HUD is in there, but I'm not sure what's missing. Tried copying the classselection file and the whole vgui/replay/thumbnails/ folder, but it's not a missing texture. And another question: I changed my chat position with basechat.res' "HudChat" ypos/xpos, but it usually resets itself to the lower part, unless I do a hud_reloadscheme, which doesn't last for long. There's a "HudChat" in HUDLayout, but changing that as well didn't cut it. YeeHaw aurah YeeHawhow do i get a black outline on my damage numbers? (using flamehud) find the font your damage numbers are using in clientscheme and add to it "outline" "1" how do i find which font my damagenumbers are using? go into huddamageaccount.res and look for the font name in the control "CDamageAccountPanel". Search for the font name in clientscheme and add the property outline to it. You will have to restart your game to see the changes. When you're healing a person as a medic the target ID says "Healing: (playername here)", is it possible to remove the Healing text and just have the target's name? KonceptWhen you're healing a person as a medic the target ID says "Healing: (playername here)", is it possible to remove the Healing text and just have the target's name? I'd guess not, since "TargetNameLabel" has just "%targetname%". But I have very limited HUD knowledge, so maybe someone knows better. aurah YeeHaw aurah YeeHawhow do i get a black outline on my damage numbers? (using flamehud) find the font your damage numbers are using in clientscheme and add to it "outline" "1" how do i find which font my damagenumbers are using? go into huddamageaccount.res and look for the font name in the control "CDamageAccountPanel". Search for the font name in clientscheme and add the property outline to it. You will have to restart your game to see the changes. In itempickuppanel.res in resource\ui\econ, change the zpos of item_pickup to 10000. Is it possible to add a shadow for the targetid's ubercharge label that does not appear on other classes like this?